An elder woman with a yard-long wooden spoon stirs a huge pan of paella bubbling over a ring of blue flame. Wine bottles pop, music pulses from the loudspeakers and the neighborhood gathers around long tables set up in the street. Today – May 18, 2013 – eleven families are celebrating their departure from the squatted building where they’ve spent the last eighteen months. The bank that owns it, Caixa Catalunya, has been forced into granting them five-year leases in other homes left empty by the crisis. 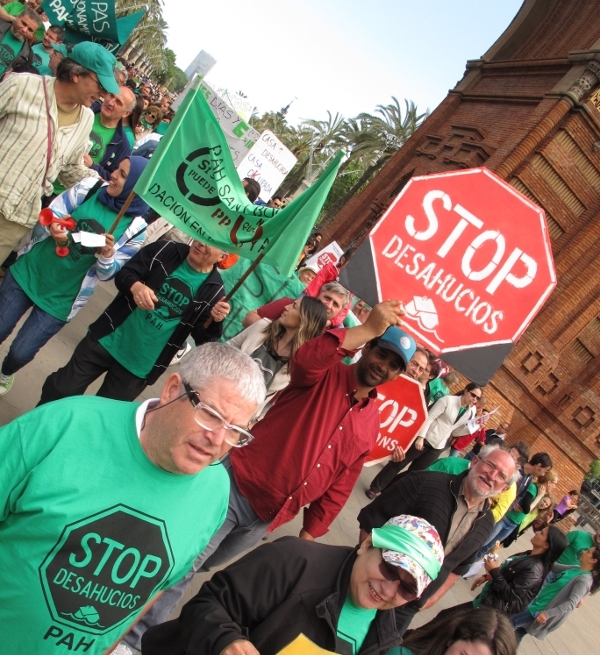 This is a major victory for the Platform of People Affected by Foreclosures, known as the PAH (Plataforma de afectados por hipotecas). For the first time, they are rehousing people at a “social rent” of 150 euros per month. It’s a benchmark. The idea is to create new rights from the ground up, in defiance of rapacious economic practice and repressive legislation. In a country with 27% unemployment, two million vacant housing units and a foreclosure rate of some five hundred per day, the PAH is a rising political force. According to recent national polls, an overwhelming majority finds it more competent to resolve the housing crisis than either of the two main parties, the conservative PP and the pseudo-socialist PSOE, whose ratings have fallen to historic lows. Here as in the rest of Southern Europe, the popping of the real-estate bubble led to a banking collapse, government bailouts, the specter of national insolvency, European rescues, a flood-tide of austerity measures and finally, a deep crisis of legitimacy affecting the entire political mainstream. How that all happened is a revealing bit of history. What happens next could change the course of the global capitalist system. This entry was posted on June 1, 2013 at 8:47 pm and is filed under Uncategorized. You can follow any responses to this entry through the RSS 2.0 feed. You can leave a response, or trackback from your own site.